I’m here to regale you with tales about ice damming because lots of us spend time dealing with it. Ice damming occurs when the underside of the roof deck is above freezing and the outside temperature is below freezing, and there’s snow on the roof. This is important to understand: You need a warm roof deck when it’s cold outside and you need snow. If you don’t have snow, ice damming is not a problem. We don’t have many ice damming problems in the Arctic because we don’t have much snow in the Arctic. You might think, “Wait, there’s snow all over the Arctic!” Yes, but it’s been there a really, really long time. More snow falls in Syracuse, New York, than in Barrow, Alaska. By a factor of 10—and that’s a big number. If somebody multiplied your salary by 10, you’d notice it. Anyway, you need snow. Let’s assume we have snow. How much snow? Four or five inches of snow on the roof has got my attention. That’s prime ice damming conditions. To get that much snow on the roof, you typically need more than 30 pounds per foot of snow load on the ground in the wintertime. 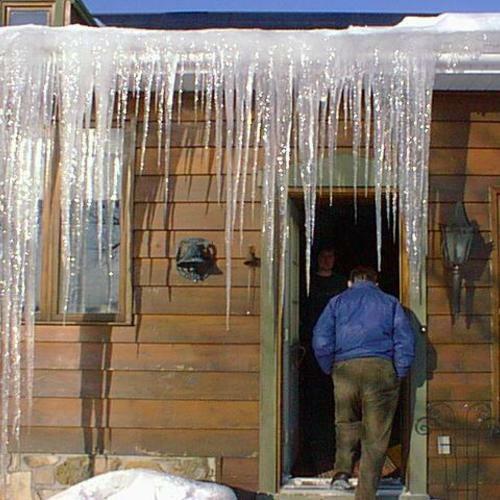 Most people know they live in an ice dam location when they notice their neighbors have ice dams. That’s a pretty good indication: You should worry about ice dams when there are ice dams. What happens when you start getting an ice dam? The snow melts. In the liquid phase, the water is wicked upward into the snow. The water is actually pulled away from the roof deck. 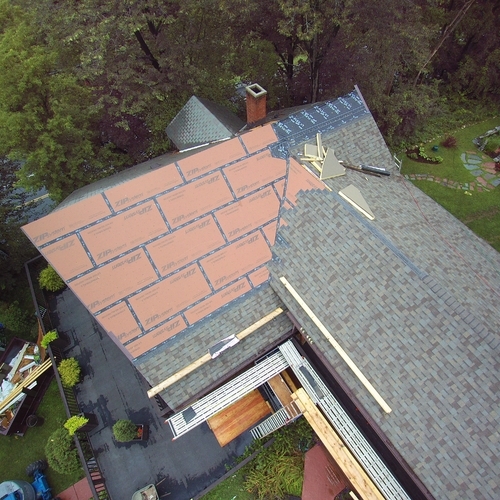 The ice layer that occurs on the roof is several millimeters above the shingles. The liquid water, before it freezes, has the ability to run down under the ice layer. Now, that would be OK if it could drain out the bottom. But it can’t. When it reaches the roof overhang, it’s really freakin’ cold because there isn’t enough heat to keep the roof deck above freezing. The ice freezes solid to the shingles and prevents the drainage from occurring; the gap is sealed by the ice. The dam forms at the perimeter of the roof because the water channel is blocked by a frozen piece of ice. The snow melts. Water is pulled up into the snow. Ice forms several millimeters above the shingles. You’ve got a drainage channel, which fills up and freezes at the bottom. And that’s when you get the buildup of hydrostatic pressure, and the stuff squirts inside the roof. So, ice damming is number one. What’s number two that you have to worry about with all that heat? Not only do you get heat, but you get moisture in the wintertime, and that moisture goes to the coldest surface: the nails. The nails frost up first. The next coldest surface is the roof deck. It gets wet, but the roof deck gets wet after the nails. The top chords of trusses usually stay dry because they’re 1 or 2 degrees warmer than the field of the roof. 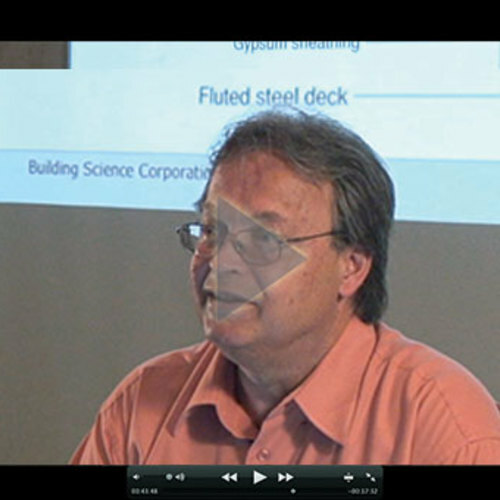 When you get rot or decay, it’s the sheathing that rots, not the structural elements. 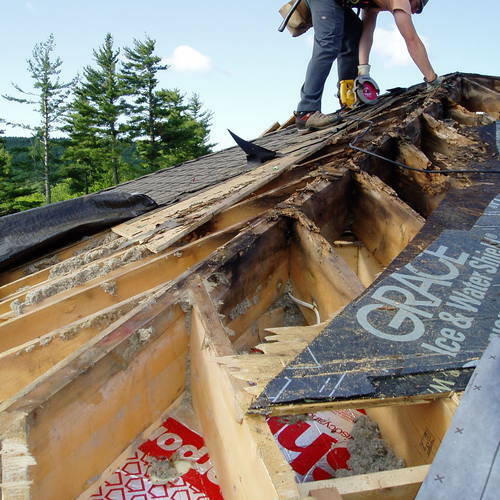 You rarely get a roof collapse, but if you walk on the roof, you pop through the sheathing. The sheathing deteriorates because the moisture always ends up on the coldest surface. In fact, you could use moisture content as a surrogate for an infrared camera. Same thing with mold. 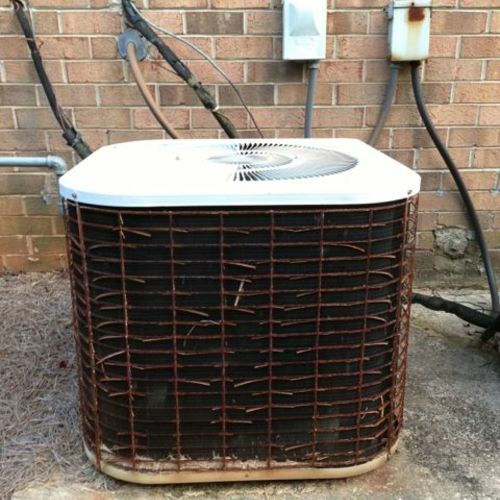 Mold deposition is determined by temperature, which determines relative humidity and moisture accumulation. Old guys made the edge of the roof slippery so that the snow could slide off. It was very effective technology, except for the people on the ground. But that’s much more energy efficient than trying to melt the sucker. The critical area is at the edge because that’s where the dam forms—so keep it warm to get rid of the snow. It’s OK in Aspen to use energy to melt the snow on the roof because the energy was created by a wind farm. How silly the arguments can be… Some builders waterproof the hell out of the roof because they don’t understand ice damming. They put an absolutely perfect membrane over the whole roof. It works. But then the ice dam gets really big and really heavy. When it falls, it can kill you. And if it doesn’t kill you, it rips off the deck. There are always reports of a heavy ice dam falling off a roof, taking a soffit or fascia or gutter with it, and knocking a big hole in a deck or knocking a balcony off. So, you have to consider the structural issues associated with ice damming, not just the water leakage issues. If you’re asking me whether it’s a good idea to membrane the heck out of the roof—it is. But you’re just treating a symptom, not the cause. This graph shows the R-value of snow versus density. Snow has an R-value of R-1 to R-2 per inch, depending on density. As a Canadian, I know this because we all live in igloos. If I have 10 inches of snow on my roof, the thermal resistance of that snow is somewhere between R-10 and R-20. This is some blinding insight, an a-ha moment: The more snow on the roof, the warmer the roof deck. And the warmer the roof deck, the more likely you’ll get ice damming. Ice damming increases with snow thickness simply due to the thermal resistance of the snow. This is a really big deal. Hold that thought. 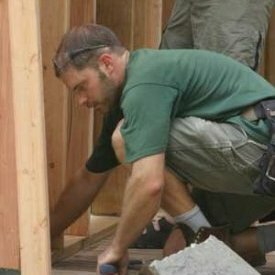 Let’s say I build an R-60 unvented roof. Surely there’s enough thermal resistance in that roof that I’ll never have to worry about ice damming. If I have 10 inches of snow on that roof, and the R-value of it is R-20, I’ve got R-20 on top of R-60, and the interface between the snow and the roof deck will be above 32 degrees. I’m going to get an ice dam. If it’s Vermont, and I’ve got 2 inches of ice on this perfectly constructed, absolutely airtight R-60 roof—the point is that you can’t rely on insulation alone to control ice damming in high-snow-load areas. 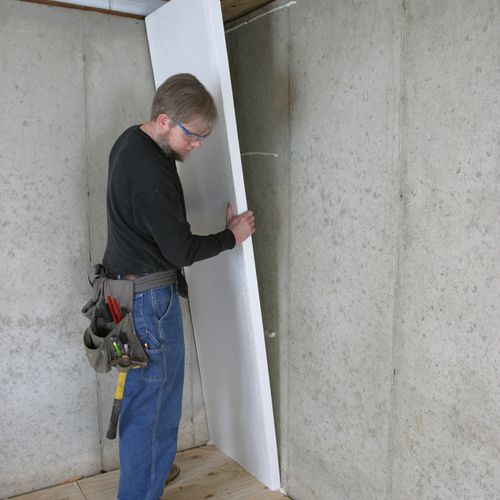 But you can rely on insulation alone to control ice damming in non-high-snow-load areas. The old guys have figured out where the high- and non-high-snow-load areas are. The best of the best of the old guys was the Army Corps of Engineers Cold Regions Research Lab. I won’t read you the reports, because the Army wrote them and they’re about as clear as the LEED program. Fifty pounds per square foot ground snow load is a high-snow-load area. The only technology available is a vented space under the roof to flush away the heat that builds up due to the thermal resistance of the snow blanket. 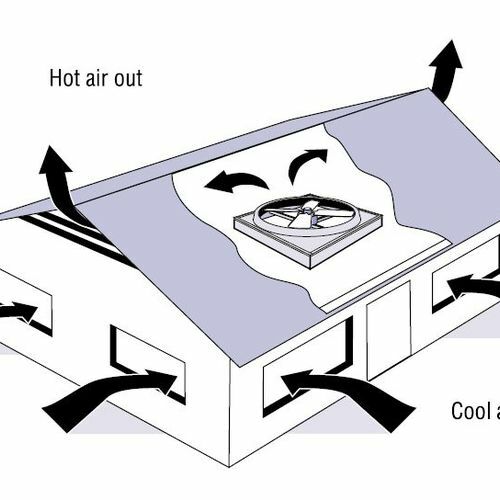 In these areas, you need ventilation to compensate for the thermal resistance of the snow. For ice damming to occur, the outside temperature has to be less than 32 degrees and the roof deck temperature has to be above 32 degrees. Five or seven inches of snow provides R-10 snow. Let’s say I have R-10 insulation and R-10 snow. Then I have R-20. If the outside temperature is 0 degrees and the inside temperature is 70 degrees, the interface between the roof deck and the snow is 32 degrees. Even at R-50 with R-10 snow, I’ll still have ice damming. Where you have lots of snow—even if you have lots of insulation and the ceiling is air tight—you’ll still get an ice dam. Now, how come, when it gets really cold, I no longer have an ice dam? Well, the roof deck temperature drops below 32 and the ice dam moment disappears. In an area with less than 50 pounds per square foot ground snow load, and with lots of insulation and an airtight roof, you can laugh off the ice dam potential. Let’s look at another ice damming factor. It’s 25 degrees Fahrenheit outside and the sun comes out and shines on the southwest side of your building. What’s the temperature of the cladding? About 45 to 50 degrees—higher with darker cladding. The dark cladding being hot, what’s the temperature of the air adjacent to the dark cladding? Hot! Where does that warm air go? Upward, right into the soffit vents. The soffit venting collects the heated air, allowing it to melt the snow and create an even bigger ice dam. I’m telling you that a vented attic can lead to an ice dam. This can’t possibly be true. What am I not telling you? It depends on where that soffit vent is located. If 95 percent of the air going into that vent is the heated air adjacent to the cladding, I have a real problem. But if 50 percent of the air going into the soffit vent is cold air, then I don’t have a problem. What we don’t know is the mixing ratio of the free-stream air to the air that is solar heated. That mixing ratio depends on the geometry of the roof overhang. So, where do you want to locate the soffit vent? As close to the fascia as possible—and not only that, but in high-snow-load areas, you’ll want to insulate the soffit. 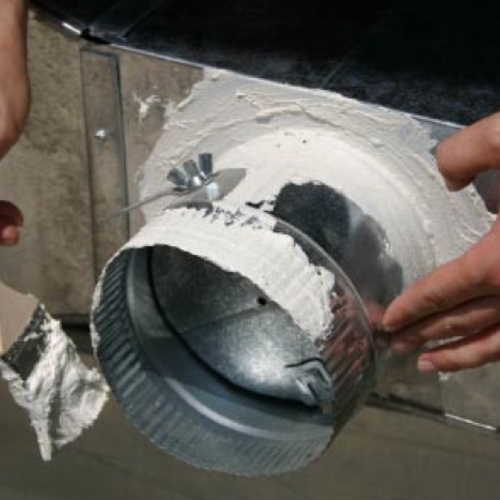 Insulate the soffit and push the air inlet to the outside perimeter to handle this problem. This is a real big deal with big overhangs. We want to insulate big overhangs on the underside and push the air inlet to the outside edge. This is a real problem if you’re building in ski resorts. The lodge on the top of Ajax in Aspen is a LEED-award-winning building, so it doesn’t work. It faces south. The sun shines on the overhang and melts the snow, so the snow keeps sliding down and they can’t use the front of the building. They couldn’t relocate the entrance, so their temporary solution was to hire ski bums to shovel snow off the roof. You don’t want them to hack the ice off a roof—not only will they remove the ice, but also other parts of the roof. The alternative technology is to put a vented over-roof over the top of an unvented roof, and introduce the air at a fascia. If someone asked me what’s the best way to build an ice-dam-controlled roof in a high-snow-load area, I would say build an R-50 to R-60 unvented roof and then put a vented over-roof over the top of the unvented roof and introduce the air at the fascia. They would say, “The ridge vent is covered with freakin’ snow!” Well, snow is not an air barrier.